This new book with the memorable cover is set in Lagos, Nigeria. It’s about two sisters, Korede and Ayoola. They’re well-off, well-educated, young adults. Korede seems to be the stable one; she’s a nurse. She’s level-headed. She knows what she wants (Tade, the hot doc). Ayoola, though, is the pretty one. Everyone wants her, and she gets what she wants. One problem. Well, two. First, she’s naïve, flighty, and a little too free-spirited. Two, she’s apparently a serial killer; her boyfriends are dead. Ayoola always calls Korede to bail her out . . . of murder! This acclaimed novel is Braithwaite’s debut, and that’s a wonder! Lara: How can you mention the memorable cover and not the title? While many of us choose books by their covers, this one had me at its title. What’s not to like? She had me at the idea of a serial-killing sister. But this isn’t your typical murder book. There’s really not a lot of blood and gore. Jennifer: And please note the comma in that title. I’m a fan. Lara: Yes! That’s a nice touch. Jennifer: I feel like we have to tread lightly in discussing this book because spoilers are easy to reveal. I will say that Korede is an unreliable narrator. We only know her side of the story, and it’s inevitably skewed. I will also say that both of us had different interpretations of the ending! We don’t want to give away anything, though. I’d like to ask you about your own comfort-level with reading a first-person narrative by someone who is potentially messed up, dishonest, or biased? Lara: Well, it works. Even if she can’t be trusted. And here’s why: None of us really can be trusted. Our stories are all skewed. We are all unreliable in the sense that we each have our own perspectives and those are influenced by our backgrounds, our baggage, our environment, our state of mind, etc. That said, I am a super trusting reader and didn’t consider her unreliable. But I totally see your point. I want to read it again with this perspective going in. Since you believe she’s unreliable, how did that affect your enjoyment of the book? Two big issues to consider in this book. First, the role of men. We are given a backstory about these girls’ childhood. They were abused. Their father was cruel. Their experience with men has been haunting and bad. Is Ayoola driven to murder? Does this make her less culpable? Second—and just for fun—do you or can you sympathize with Korede’s position? Would you do the same? Protect and cover up a murderer? For whom? Lara: Their father was horrible. I definitely think Ayoola’s experiences influence how she treats men now. Her past cannot be a justification for murdering all of her boyfriends, though. People have suffered worse and not become serial killers with sisters who clean up after them. To your second question: It doesn’t matter who you are in my life; if you murder someone, I am not your murder maid. Nope nope nope. All the nopes that ever noped. Jennifer: This might be the distinguishing feature of this slim novel. It’s about family, and the impact our family has on us. It’s very interesting that Braithwaite never explicitly connects their past with their father with their present crimes. There is never a big expository moment on the consequences of abuse. Basically, for the creative writing students out there, it’s showing rather than telling. My favorite part of this narrative, though, is the story surrounding Muhtar, her coma-patient/confidante. Korede, as a nurse, sits in his hospital room and speaks to him. She tells him everything. He’s unconscious—but, then, much to her surprise, he wakes up! I think—besides any of her potential confessions to him—he provides some opportunities for ruminations on friendship. This is extraordinary for her. Also, Muhtar philosophizes about her predicament. This may be the heart of the novel: love turns us into murderers . . .
Lara: It could be, but not in the traditional sense. 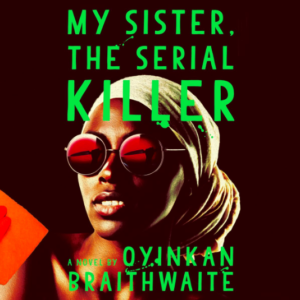 Ayoola murders as a way to take control of her past. Korede literally cleans up the mess, and this is their tie that binds. Lara: I would recommend it. It’s not shiver-inducing the way a true mystery/thriller would read. It’s more a book about the relationships and the power they can have over us. And, as always, chime in and let us know if you read it! Jennifer: And since we’ve moved to a new format (meeting more irregularly but still reading crazily), we thought we’d share with you some of our most recent book notes. Lara, tell me have you come upon any MUST-READS? Lara: I finally got to Tayari Jones’ An American Marriage. I felt she perfectly captured how flawed we are, how challenging relationships can be, and how a single incident (or two or three) can change the trajectory of your life. I also read Michelle Obama’s Becoming. If you listen to it on audiobook and increase the speed just one level, it’s like she’s physically sitting next to you on the couch telling you her story. Jennifer: The book I fell head-over-heels in love with these first few months of 2019 was Jennifer Clement’s beautiful Gun Love. That is my must-read. I’m trying to do more fiction this year, because I did so much nonfiction last year. I read quite a few good books, but if you’re writing one down, it’s Clement. Any particularly great audiobooks for you? Lara: YAY! I am so glad you read and loved Gun Love! I think it’s the most underrated novel of 2018. Jennifer: I actually have listened to some out-of-my-comfort-zone audiobooks that I’ve really enjoyed. The Girl With All The Gifts by M.R. Carey was super fun. Zombie fiction. Zombie literary fiction! And Stephen King’s The Shining was a blast. Horror is not my thing, but King is a great writer. Lara: Ooh, if I agree to listen to The Shining, will you listen to his latest, The Outsider? Join us next when we meet to discuss Valeria Luiselli’s much-anticipated Lost Children Archive. Want to read more from Jennifer? Check her out at www.jenniferspiegel.com and her latest book: And So We Die, Having First Slept. You can get it on Amazon right here. Want to see what Lara is up to? Go to www.onelitchick.com.